Oracle, AZ—On March 6, 1994, seven researchers—five men and two women—were sealed inside the closed ecological system and research facility in the Santa Catalina Mountain foothills north of Tucson. C. Overall Engineering: William Dempster with inputs from John Allen. Margret Augustine: CEO, reviewed all aspects of Mission One and she and Allen had to approve all decisons. (ORACLE, ARIZ) On September 26, 1993 the eight crew members of Biosphere 2 will step out into Earth’s atmosphere, completing their two-year mission inside the closed ecological life support system and research facility in the Catalina Mountain foothills north of Tucson.The project was designed for three purposes: research, education, and the development of environmental technologies for use on Earth and in outer space. Biosphere 2 is an unprecedented, on-going ecological experiment. It is a tightly sealed glass and steel structure on 3.15 acres near Oracle, Arizona in which scientists have created seven complete ecosystems or biomes that mirror those of Earth. The systems include an ocean, a desert, a savannah, a rainforest, a marsh, an area of intensive agriculture and a human habitat. The Biosphere2 experiment is a broad one that begins with the eight-person Biosphere2 crew, but extends into many scientific disciplines and encompasses many studies. For certain aspects of the project, the designers and builders of Biosphere 2, Space Biospheres Ventures consults with independent institutes, firms and individuals. In addition, numerous research scientists in Biosphere 1, our Earth, conduct parallel joint studies with the Biosphere 2 crew. The Biosphere experiment has proven successful in the human dimension as well, offering valuable insights into how we live, how we organize our tasks and our time, and how we can maintain good health. In the field of nutrition, Biosphere 2 marked the first time that a human group consuming a rigorously controlled, calorie-restricted, nutritionally dense diet has been systematically studied over a two-year period. This regime has been extensively studied in laboratory animals, and has been found to have substantial health benefits. Researchers now have evidence that humans respond in the same way. 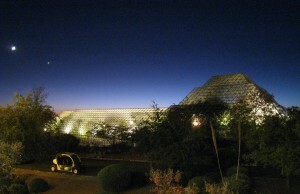 Biosphere 2 has met the challenge of developing a sustainable agriculture system. The eight crew members managed to operate the system producing food for themselves and their domestic animals without the use of toxic chemical pesticides or artificial fertilizers on approximately one-half acre, recycling water and nutrients within the system. This was an encouraging beginning for the first two years of what the creators of Biosphere 2 hope will be a one hundred year experiment during which the agriculture systems will be further developed. To achieve an enclosed, regenerating life-support system, the Biospherians have had to recycle all human and animal wastes, maintain a healthy atmosphere, and retain and recycle salt and fresh water ecosystems as well as utility, rain, and potable water systems. 10. Results: Biosphere 2 Status Report: Engineering Breakthroughs. 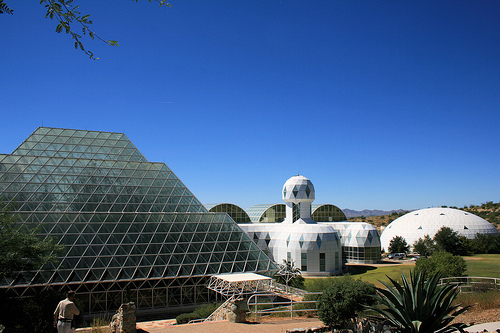 Biosphere 2 represents an engineering achievement of enormous complexity. During the first two-year mission, its huge physical plant operated successfully, sustaining eight humans and approximately 3,800 species of plants and animals in seven biomes with no major operational setbacks. In the process, it demonstrated that it is indeed possible to create a closed ecological system that can support human beings. The information system of Biosphere 2 is a prototype of a powerful, sensitive environmental monitoring system. It works around the clock to collect, analyze, and display a huge volume of data on a real-time basis – alerting the Biospherians and Mission Control to trends and possible problems – and to then store that information in a form that will be useful to researchers at a later date. A medical team headed by Biosphere 2 Medical Consultant Dr. Harvey Meislin has been organized to closely monitor the Biospherians when they re-enter Earth’s atmosphere on September 26. Dr. Meislin is Professor and Chief, Section of Emergency Medicine at the University of Arizona College of Medicine. (Oracle, AZ) When the airlock of Biosphere 2 opens on September 26, 1993 to conclude its first mission, Transition One begins. It is to be a period, lasting approximately five months, of intensive data collection, new research projects and modifications which will continue until the next crew enters the sealed ecological research facility. Transition One will also be the time that the crew for Mission Two will complete their training. When the first phase of the Biosphere 2 experiment was completed on September 26, 1993, a transition period began. Teams of nationally prominent consultants, experts in their various fields, came to study Biosphere 2 before its next phase. Oracle, AZ -Twenty days and counting… On March 6 at 10 a.m., an international crew of six individuals from five countries will enter Biosphere 2 under new scheduling procedures. March 6 commences a new phase of the experiment which will mark the last formal “closure” in putting a new crew inside the three acre glass-and-steel complex. The new procedures will enable various visiting scientists to conduct research for designated periods of time within controlled laboratory conditions in a way not possible before.